1. We live in submission to the Word of God. Recognizing that God’s Word has all authority, we are committed to believe and obey the Scriptures. 2. Our goal is Christ. 3. We are separated to God. 4. We serve the Lord as members of a local church. 5. We are faithful witnesses unto Christ. 6. We recognize the stewardship of life. 7. We deal with others in honesty and sincerity. 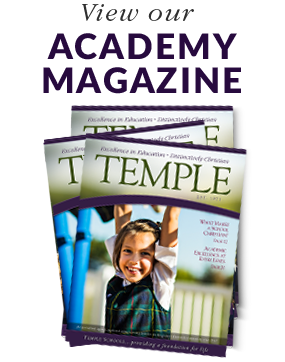 The philosophy of education held by Temple Baptist Academy grows out of our theology. Believing in the one true and living God as revealed in the Scriptures, and believing that redemption for fallen man has been provided through the death, burial, and resurrection of His Son, the Lord Jesus Christ, we therefore hold a philosophy of education which recognizes God as the Author of all truth, and which centers on the Person of Jesus Christ. We reject any philosophy that does not recognize the existence and nature of God as taught in the Bible, and that does not recognize that the chief end of man is to know God through His Son and to glorify Him. We believe in one Triune God, eternally existing in three persons—Father, Son, and Holy Spirit, coeternalin being, co-identical in nature, co-equal in power and glory, and having the same attributes and perfections (Deuteronomy 6:4; II Corinthians 13:14). We believe that God created the entire universe in six literal, twenty-four-hour days (Genesis 1:1-27). We believe that the Holy Spirit is the Person who reproves the world of sin, of righteousness, and of judgment; and that He is the Supernatural Agent in regeneration, indwelling all believers and sealing them unto the day of redemption (John 16:8-11; II Corinthians 3:6; Romans 8:9; Ephesians 1:13-14). We believe that the sign gifts of the Holy Spirit, such as speaking in tongues and the gift of healing, were temporary. We believe that speaking in tongues was never the common or necessary sign of the baptism or filling of the Holy Spirit and that ultimate deliverance of the body from sickness or death awaits the consummation of our salvation in the resurrection, though God frequently chooses to answer the prayer of believers for physical healing. We believe the “Blessed Hope” of our Lord’s return is literal, personal, visible, imminent, premillennial, and pretribulational. Believers will be caught up to be with the Lord prior to the seven years of tribulation, and at the end of the tribulation Christ will return with His saints to establish His thousand year reign on the earth (I Thessalonians 4:13-18; Titus 2:13; I Thessalonians 1:10; Revelation 3:10; Zechariah 14:4-11; Revelation 19:11-16, 20:1-6; Psalm 89:3-4). The Statement of Faith does not exhaust the extent of our faith. The Bible itself is the sole and final source of all we believe. We do believe, however, that the preceding Statement of Faith accurately represents the teachings of the Scripture.